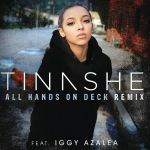 TINASHE zunächst schmusig, dann ein fiebsiges Synthi-Geblubber - was treiben die da unter der Bettdecke ... Hände hoch ... aktueller R'n'B Pop ... selbst Iggy nervt nicht weiter. Not bad, though Tinashe > Iggy in this. Iggy tries quite hard to mess up what Tinashe has going on here but it's still likeable with her though. The solo version is a 6* though. The production is somewhat interesting and in parts very different, however Iggy is clearly only there for star value as she adds nothing. Not too bad but nothing to write home about. Love this, Iggy's verse slays!